US Marshal Grier Vanderhall bucked her socialite upbringing to bury herself in law enforcement. She sees things in black and white, which is why it never would have worked out with black ops soldier, Reid Cormier. His way of life–living outside the law–was too much for Grier, and the pair went their separate ways after Grier faked her death in Night Moves (Book 4 of Shadow Force). Now Grier is ready for what should be an easy job – protecting Benji who is set to testify in a highly-watched case stemming from the world of underground fight clubs. However, it appears that Benji isn’t ready to part ways with his former life. When Grier goes missing, her partner Jack calls in Reid for help. Oh how I have missed the men and women of the Shadow Force. While Night Moves was a wonderful wrap up for many aspects of the series, poor Reid and Grier parted on terrible terms. It is wonderful for long-time fans of the series to finally see these two have their HEA. However, you do not need to have read the earlier books to enjoy Lonely is the Night. The story is independent from the other books in the series and can be read solo. Ms. Tyler is a master at putting her characters in impossible situations, ones that make you want to give up and walk away, and just when you think it can’t get worse, she unveils her plan for a happy ending. Lonely is the Night is another suspenseful nail-bitter, breaking the characters down to their lowest before allowing them to rise above the fray. The novella is chocked full of little nuggets and guest appearances from the first four books in the series, making it a fun walk down memory lane. 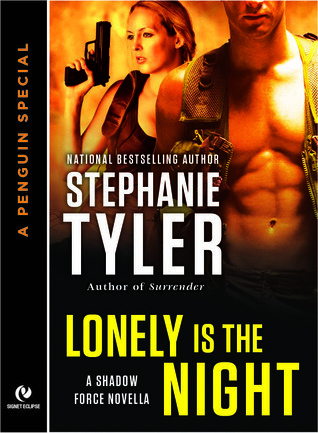 There are also a few new characters that had me wondering which would appear in Ms. Tyler’s new series, Section 8 (stop back tomorrow for my interview with Steph and a giveaway of Surrender, the first Section 8 book). There were points in the novella I felt a little confused or that the action was rushed, but since this is a shorter-length story, it is to be expected. I was a little disappointed at the almost gloss-over of the final trial and ending, which effectively killed the building suspense for the moment. However, it is a satisfying ending and on the whole, an entertaining story. Overall, I delighted in finally getting to see Reid and Grier together and the men of the Shadow Force all content. It was a good conclusion to the series, although I do wish it’d been full length. I’m guessing the next series will follow Grier’s former partner, Jack and possibly Reid’s friend, Keegan. (Note, this was my guess prior to reading Surrender. The neither of these characters appeared in the first Section 8 book, but I’m hoping we’ll see them again.) If you are new to Ms. Tyler’s work, this is a great taste of her writing; however she is even better at full length.